Out of commission for 2 days..
Not sure what it was, maybe it was something I ate at my sister’s birthday dinner Saturday night, but Sunday I woke up and just felt “off”. I managed to eat a bit of oatmeal for breakfast, and even munched on a chicken finger and a few fries for an early lunch. But after that, my stomach felt even more unsettled. So for most of the afternoon, I stayed in bed, feeling very unsettled.. until.. well, I lost my breakfast and lunch. It wasn’t pretty, but I gotta say, I felt better afterwards. Still stayed in bed for the rest of Sunday though and I called in sick at work on Monday, and again spent alot of time in bed. No appetite at all, which meant I had to cancel my Monday night Crossfit class. Wasn’t very happy about that at all, but I knew there was no way I’d make it through a class if I wasn’t eating. Today I’ve eaten breakfast (2 eggs and hashbrowns) and so far I’m feeling okay. A slight headache, but that’s usually normal for days I’m in at work @ 6:30am. I definitely need to drink alot of water today, the past couple days haven’t gone well in terms of staying hydrated, so that will be my number one goal today. Drink water! Can’t wait to be back at Crossfit tonight. I haven’t even attempted a double under, so I stuck to the single skips. Definitely need to invest in my own skipping rope so that I could practice at home. Anyway, I missed last night’s workout, which means really I’ve been off for 2 days (Sunday/Monday) but it’s enough to make me miss Crossfit. I’ll still make it out to 4 classes this week, but it doesn’t seem enough. I want to get to 5 classes a week, that would be really great I think. Friday night was a really good workout as well, we worked on our deadlifts, working towards our 1 Rep Max. I managed to get to 165lbs, which is so exciting considering prior to joining Crossfit I never did deadlifts and was really intimidated by the idea of doing deadlifts. After working on deadlifts, was a 1000m row. Everyone had to write down their time. I finished in 4mins 25 secs. There were guys that were finishing in under 3 1/2 mins! Crazy! The first couple minutes went okay, I was feeling good.. strong.. I was thinking I’d finish in great time if I kept up with the pace. Yeah, then I hit a wall and I slowed down significantly. And it was really tough to get through the last 200m. What’s great though is people around you are pushing you to keep going, telling you you’re doing a great job. I’m still not used to hearing the motivation but I think I’ll get used to it soon. Back to the 1000m row, and actual the rowing machine in general. In the past, whenever I saw rowing machines at the gym I would wonder who on earth would want to go on a rowing machine and what kind of workout could you really get out of a rowing machine? It always seems like the cardio machine you went on, if you really didn’t want to work out.. hehe.. boy was I wrong. Those things are definitely harder than they look and definitely will get your heart racing and the sweat dripping! A great piece of cardio equipment, and definitely harder than the treadmill or the elliptical (in my opinion). I’m currently working on Foundation, so not yet working on Power Cleans or Power Snatches, can’t wait til I move onto Building. Not sure when that will happen though, I suspect that I need at least a few months working on Foundation before moving onto Building. Can’t wait! Oh, and I also need to start shopping for new shoes. Maybe Crossfit-specific shoes. For some odd reason, following my 1000m row, the arches in both of my feet were just killing me, and super tight. A guy at class asked what was wrong, when he saw me rubbing my foot arches and I told him they felt really tight and sore. He took a quick peek at the runners I had just taken off and suggested that perhaps I needed to buy a new pair of shoes, maybe a pair made for Crossfit. He said I needed more flexibility in the sole of my runners. So yay! A reason to shop! 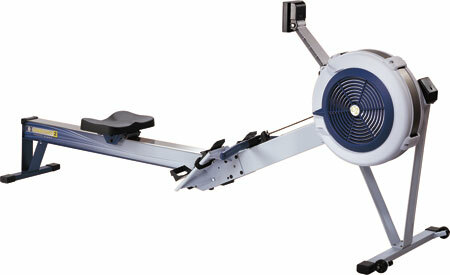 Have you ever been on a rowing machine? How did you find it? 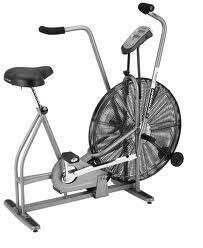 My love/hate relationship with the Air Dyne bike and when it hurts.. KEEP GOING! Today was a tough workout.. there were only 2 exercises on the board: front squats and the air dyne bike – 3 minutes ALL OUT! First it was really exciting to work on my front squats. Very intimidating to see the other girls lifting so much weight but I know in time I’ll get there. Today I squatted 85lbs. We’re supposed to go as high as our 2 rep max, and I’m sure I could have gone a bit heavier, but I really wanted to focus on my form. So many things to think about, bar right by your neck, core tight, elbows out front, back on your heels.. oh and don’t forget proper breathing. I know it time it will get easier and won’t take so much effort. But I’m very happy with 85lbs, I think with back squats at home, I was only getting up to 75lbs. So already there’s an improvement. Next up was 3 minutes on the Air Dyne bike ALL OUT and then 10 minutes rest, for 3 rounds. Sounds pretty simple right? But these bikes.. ooh.. so deceiving! At first when you start I’m thinking “all right.. arms and legs moving.. how hard can 3 minutes be? I’ll push harder with my legs for the first minute, then use my arms more for the second minute and then back to legs for the third and final minute” Yeah, definitely didn’t work out that way. First minute isn’t that bad but by the time I hit 1.5 minutes I am thinking “when is this over?” And of course the last 1.5 minutes is pure torture. Once the three minutes is up, I cannot feel my legs. I step off the bike and feel like my legs are going to collapse from underneath me. It’s such a weird feeling, feeling like your legs can’t support you. And all I want to do is sit down, but I can’t. The lactic acid is building in my legs and I need to keep moving to flush it out. Ten minutes of rest is pretty good but boy does it go fast when you’re trying to recuperate from the hard 3 minutes. The last round was really tough, poor coach was standing next to me, pushing me hard, cheering me on. And most people like that, need that motivation and push to go hard. Me? Not so much. Hearing someone tell me to “GO, harder.. you can do it.. you’re almost there!” doesn’t really do that much. I even told the coach “my hubby’s been pushing me hard for as long as I’ve known him and really it doesn’t help” hehe.. so the coach walked away for a bit, but came back to push me hard for the last 30 seconds. Last 20 seconds he was yelling in my ear “finish strong!” and you know what? I gave it all I had and everything hurt and I was so glad when those 3 minutes were over. My legs were so wobbly that I couldn’t even kneel to the ground to start my stretching and foam rolling, it was so bad! Trying to stretch my quads out didn’t really help so I tried my best to keep moving and walked around for a few more minutes. One girl there asked me if I was a runner. She said I had a “runners physique”. I wonder what that means exactly? And I hope it’s meant as a compliment. Tomorrow I’m back at Crossfit and I’m hoping my legs have recovered from today’s workout. Long weekends are always nice… and Healthy Banana Muffins! Not so nice when they’re filled with rain though. Yup, that’s exactly what we got here this long weekend. 3 days of rain! The gloominess definitely made it difficult to get energized and all I wanted to do was stay in bed under the blankets. The temperatures inside the house were quite cool, but it just didn’t feel right to turn the furnace back on when we’re so close to June. This morning though was way too chilly and I felt bad for the kiddies, so I did turn the furnace back on.. UGH! This past weekend we had a couple birthday parties, one for my nephew and the other for one of my close girlfriends. The kids had a blast at the kids birthday party, and the adults had a blast at my girlfriend’s party. I have to admit I drank way too much wine! And ate way too much pizza, chips and deep fried wontons.. oh yeah! hehe.. I think that may have been the must indulging I’ve done in a long time. There are some guilty feelings about it, especially when the birthday girl (after her numerous glasses of wine) asks me to show her my abs! haha.. after eating all that food and drinking all that wine?! No way my abs were going to make an appearance. I told her she should’ve asked me at 6am, when my tummy was nice a flat and empty! hehe..
We didn’t get home til 1am and we all slept in til 10:30am! We slowly got out of bed, had breakfast at home and got ready to head to the mall. With all the rain, there really wasn’t much else to do. After hanging out at the mall and having dim sum for an early dinner, we headed home so that I could get ready for the work week. Later in the evening, after the kiddies had supper and had their showers, poor J threw up, not once, but TWICE! It was really bad timing that it happened while he was in our bed (both times). So the comforter is now hanging in the garage, after I sprayed it down in the tub to clean it up as much as I could. It will now have to be taken to the drycleaners since there’s no way it will fit in our washing machine/dryer at home. And luckily I had brand new sheet set in the closet to open up, after he soiled 2 sheets. Needless to say, it was a very tiring Monday evening. Luckily he went to bed fairly quickly and there was no more throwing up. In a bigger bowl, mix the coconut oil and honey until well combined. Add the 2 eggs and the mashed bananas. Pour into 12 lined muffins tins and put in the oven @ 325 degrees for 20-25 minutes. Use a toothpick inserted into the middle of the muffin to ensure the muffin is thoroughly baked. I was surprised at how delicious they turned out, without any butter or milk. This week is a short work week! yay! and hubby is working days so he will be home in the evenings. double yay! I’ve got Crossfit tonight, Wednesday, Friday and Saturday. Besides that, not much else going on. I didn’t get any organizing or de-cluttering done at home this past weekend, so that is still on my to do list. My cousin did say she would pick up the crib that’s still in my bedroom, so I’m really excited to get that out of the house! My glutes that is. I’ve done squats before, occasionally did lunges too. But it was only after Wednesdays WOD when I finally felt soreness and tightness in my glutes. And I love the feeling, knowing that my workout really targeted my glutes. Today was a pretty big day for me. First time ever doing deadlifts. Deadlifts are one of those exercises that I am completely intimidated by. At the same time, it’s also super impressive to hear ladies hitting their PRs. I can’t wait to challenge myself to go heavier each week. We also did unassisted pullups. 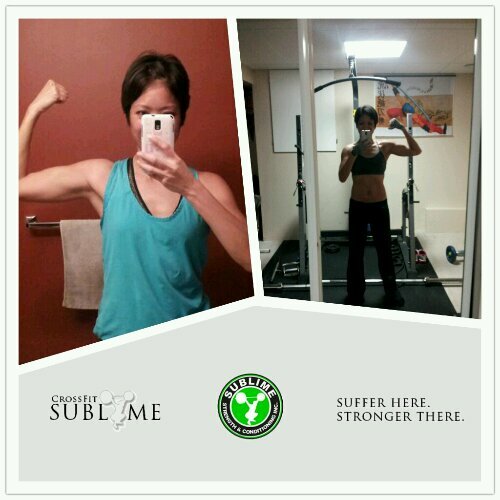 I was able to do 3 reps, 3 sets. The last rep of each set was really hard, but I did it! Such an amazing feeling. It’s the long weekend here in Canada, yay! Although it’s raining for the next 3 days. I’ve got alot of cleaning and organizing to do at home. Hoping for a really productive long weekend. And it’s hard to believe that it’s been a week since my last post. What have I been up to? Work has been busy and I had to provide feedback on one of the contractors that works for me regarding his poor performance. Turns out they gave him his two weeks notice. Eek! I really didn’t expect that, I feel awful but at the same time relieved because I won’t have to rescue him on his projects when things get tough. I’m trying hard to not feel bad, but it’s tough. Running – not much of that happening. I haven’t made it out since my 9 mile run a couple Sundays ago. I was planning on going for a run thus past Sunday but couldn’t get motivated to lace up and go. This Sunday I’m aiming for a 10 mile run. If this goes okay, I’ll be ready for the half marathon on June 16. I didn’t record my pace during the 9 mile run, so I don’t really know if I’m close to running a 9 min mile or if I’ve got a ways to go. I know that we ran without stopping, and that’s very motivating for me. If I have enough energy after my Crossfit classes this week, I’ll try to get some speed work done. Although I’ve read online that Crossfit definitely can help with marathon training, esp in terms of cardiovascular health and endurance. Plus my legs will be stronger. Still debating on whether or not I should purchase a GPS watch so that I can measure my pace, esp since I do have a time goal for the 1/2 marathon. I’ll have to make a decision soon. And at the same time, I should restart my hunt for new running shoes. After having no luck with the last 3 pairs I purchased, I sorta gave up. But they’re definitely required still. Crossfit – lots to learn and very challenging but I’m absolutely loving it. I love the small class size which allows the coach to watch our forms, to provide corrections and motivation. I feel like I’ve got a personal trainer which is awesome. I don’t always do very well when someone is right in front of me, pushing me to keep going, so it will have to be something I get used to. Did I ever mention the time I was giving birth to my 2nd baby and hubby was trying so hard to be motivating and encouraging. He kept telling me I was doing great, to keep going.. stay focused. But I had to tell him to just shut-up.. hehe.. I remember saying “I know you mean well.. but please.. stop talking.. I don’t want to hear your voice..” hehe.. Ultimately, my goal is to attend 4 classes a week and hopefully make it out for a 5th class. It’s a bit aggressive, considering I’ll have to ask my parents to watch the kids during the 2 weeks that hubby is working in the evenings, but they’re really supportive (I’m so lucky) so they usually don’t mind when I have to run off to the gym. I’m trying to stay focused on small progress and reminding myself that the strength will come in time. This is extremely difficult for me because I have such little patience. But I’m hoping to stay focused and motivated through the next few months. Also changes in my physique will also take time. First time taking a full back progress picture, definitely wasn’t easy to do, so this is the best one I took. 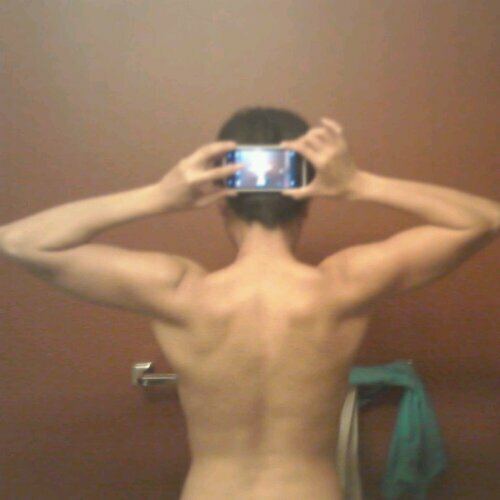 I really want to work on my back, to see more definition and lean out a bit more. Aside from back, I also want to improve on my shoulders and legs. I suspect with all the front squats, deadlifts and box jumps, my legs will definitely see an improvement, and I can’t wait! Still eating clean most of the time but still enjoying a few treats. Need to get back to cooking more meals at home. Meal planning is almost non-existent right now, I just throw together a meal a few times a week. Must get better at it. 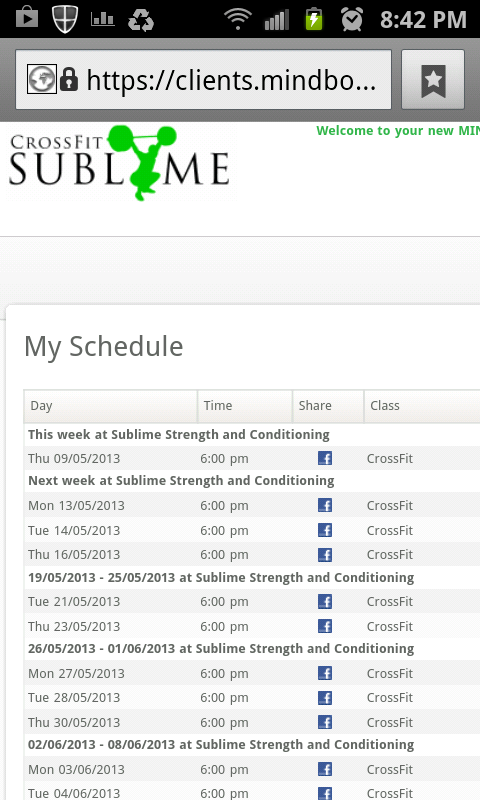 So I did it… I signed up for a 12 month Crossfit membership. It’s definitely more than I’m comfortable spending on a monthly fitness membership but it’s a good investment and will be a very good challenge for me. I can’t wait to see my progress! Todays class seemed fairly easy when we went over the exercises at the beginning of the class. 4 burpees and a sled push w 45 lb plate and then rest until the timer hit 1 minute 15 seconds. This was repeated 15 times. I was definitely breathing hard and working up a sweat. And when I came home I signed up for my next 12 classes. I’m hoping to do Crossfit 4 times a week and run at least 2 times a week. It’s alot going on, so I hope I can manage. For the past week, I’ve been telling myself that I would be back outside running this weekend. I didn’t make it out yesterday though. I don’t even have an excuse, I just didn’t push myself to go and so last night, I had a little pep talk with myself to go out Sunday morning for my first run after an entire week of taking it easy. I slept in a little but managed to get out of bed around 8:30am. I quickly ate a slice of toast with peanut butter.. my running fuel. I don’t know if it’s just me, but I feel SO much anxiety before each run. I think I feel more anxiety because I’m so nervous about the run and the possible pain I’m going to feel and not being able to go as far as I’d like. And so for an entire 30 minutes this morning I just continued to build up the anxiety in my head, making me feel a bit sick to my stomach. Definitely not healthy. Before I headed out, I started thinking about the distance I would aim for. I knew I wanted to do at least 5 miles, and I thought maybe 6 miles would be a good distance considering I haven’t run the entire week. So hubby and I started our run. It was a beautiful Sunday morning, sunny with a cool breeze. We hit the 3 mile mark and I told him I was feeling pretty good, so we continued on. I felt really good, hips/legs were a little tight (which I expected due to my lack of running) but I was enjoying the run. We went for another 1.5 miles and then decided to turn back. Although I was feeling great, I knew that it was still possible for the pain to start, so I didn’t want to be too far from home. Our pace slowed down a bit near the end of our run but we made it! And we actually ran without stopping for a walk break. Even better! And final distance? Just shy of 9 miles! OMG.. when I got home and mapped the route onlne and saw that we had almost run 9 miles, I was ecstatic! The pain didn’t appear although I am still feeling a little sore/tight. I’m hoping with continued stretching today and tomorrow I’ll be ready for another run on Tuesday night. It was the perfect way to start my Sunday, an almost pain free 9 mile run. Now I know that I can definitely run the 1/2 marathon in June. A part of me is thinking maybe I can still train for the full marathon but hubby is saying to just take it easy and not to push myself which would result in injury. So I’ll continue to train for the 1/2 marathon, even hoping I can push myself to finish in less than 2 hours. We’ll see about that one. I know it’s an aggressive goal for me, but hey you never know. If I can keep up with the Crossfit workouts for the next 4 weeks, maybe running a fast 1/2 marathon pace won’t be so hard! Now I’m excited.. the 1/2 marathon is on, and Crossfit starts tomorrow with a foundation building class. I’ll be going through various exercises like the front squat and deadlifts and proper form. I had planned on going in for my Crossfit assessment earlier this week but they were booked up and this morning was the earliest that they could see me. So I headed down at 7am, not really sure what to expect. I wasn’t sure if this was a sit down assessment where they just ask me about my fitness goals, expectations of Crossfit, etc. Or if there was going to be any fitness type tests. So I made sure to wear my work out gear. However, I didn’t eat breakfast and well.. that made things a little difficult during the fitness test part. So after I filed out my portion of the assessment form, he went to check my flexibility and mobility. Kyle (coach) was surprised at my flexibility. I had told him I was training for the marathon and was running quite a bit and also did some weight lifting, and I guess he didn’t think I’d be as flexible as I was because I was a runner. Kyle thought I did well with the flexibility and mobility. He then showed me some different stretches to do following my warm up and then came the fitness test. 10 pullups (unassisted) <– this was actually very intimidating to even see on the list!! I went hard for the first minute on the bike.. actually surprised that the calorie count didn’t go up as fast as I thought it would.. hehe.. I quickly realized that I’d hit the 2 minute mark before the 40 calories. Going into the 2nd minute, my pace slowed down and I was TIRED! hehe.. Kyle was there pushing me through (which is good and bad.. hehe) and the last 10 seconds seem to go on forever.. but I finished. But as soon as I was done, I had to move on to the 40 air squats. OMG… my legs were so tired after the 2 minute bike ride.. how was that possible? I thought I was in good shape! hehe.. Anyway the first 20 squats were hard, the second 20.. even harder.. and I was going at a snail’s pace. But again, I pushed through (with the help of Kyle’s encouragement) and moved on to the situps. I think I got to 24 situps and the 5 minute timer went off. So I didn’t make it to the pushups or pullups.. can’t imagine how many pullups I’d even be able to do when I was already so winded and tired from the first 2 exercises! And I tell ya, that was a very intense 5 minute! Kyle recommended that I walk to one end of the gym and back to cool down. But I could barely stand! I’ve never experienced it before, when my knees were ready to give out! My legs were so tired! I could barely do the cool down walk, I was definitely wobbly! I even had to lay down afterwards, not so much that I was tired over all and had to catch my breath, but I just had to get off my feet. I had to ask Kyle if every class would be that intense and he assured me that future classes would not be as intense, and it was only for the fitness test to capture a performance baseline. I was walking pretty slowly to the car, but I survived and I’m now here at work. I signed up for a Foundation class for Monday, where Kyle will walk me through front squats, dead lifts and some of the other main exercises. Before I left, he asked me if I was interested in Olympic lifting, and I told him I was but didn’t think I could do it, but again he assured me that I could and it would just be a matter of building that foundation. So as of now, I haven’t signed up for a membership, I’ll do that after Monday, as long as I survive the class. This weekend I’ll be going out for a couple short runs, so I hope that goes well. I haven’t gone for a run all week, really taking it easy, which means this next run is going to be a tough one. But my plan is to take the next 4 weeks to build up to 10 miles so that I have a chance at the 1/2 marathon on June 16th. Ultimately the goal would be a sub 2-hr 1/2 marathon, but I’ll play that by ear.